La Isla Cuchifritos is exactly what it sounds like: an island full of jujyfruits. Except instead of jujyfruits, this place has a wall-mounted menu of fried finger foods. Ok, so it's not exactly what it sounds like, but you get the idea. An oasis under elevated train tracks, La Isla is a Puerto Rican greasy spoon serving up pork products that the whole family can enjoy. 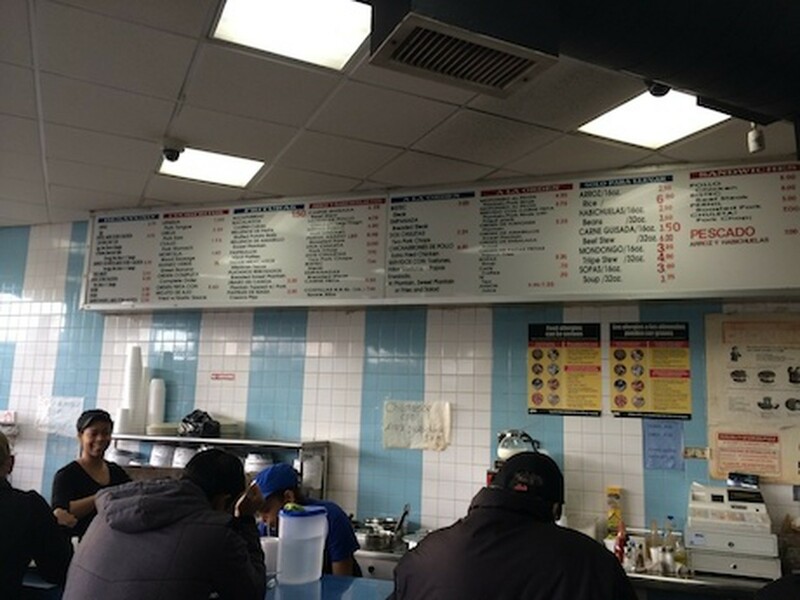 With locations in Bushwick, the Bronx, and Sunset Park, La Isla has a strong following in a number of neighborhoods. We've been to the Bushwick location a few times now, and love it for the fact that a) it's cheap and delicious, and b) it sort of feels like you're grubbing in tropical Puerto Rico rather than not-so-tropical Brooklyn. We were initially drawn here for the fried treats known as "cuchifritos," but have found that the best bites actually come from other parts of the menu. The half chicken and rice is as good a rotisserie style bird as we've had in recent memory, and the roasted pork - served by the pound - is truly excellent. Top it off with a side of sweet plantains, and this is a $15 meal for two worth celebrating. And by celebrating, we mean ordering the fried pork stomach and codfish cakes to take for the ride home. We are absolute suckers for sweet plantains, and these delivered in a big way. Sweet and gooey while maintaining good consistency and chew, we would have paid a lot more than $1.50 for an order of these. Luckily, that's all they asked for. A bit starchy, and there was no designated dipping sauce to help these out in the flavor department. All in all, nothing special. Despite sitting under what appears to be a heat lamp, these are pretty good. The flaky crust works well with the meat and onion filling for a solid pre-meal snack while you wait on the rest of your order. At last, the prized cuchifritos. I was always told growing up, “don’t say yuck to somebody else's yum.” Well, sorry mom, but yuck. Too much fat, too much fried, and not enough flavor. These may be La Isla’s signature bites, but we enjoyed our meal without them just fine. $5.50 gets you half a rotisserie bird, butterflied and pulled apart with yellow rice and kidney beans on the side. Feel free to request a leg or a breast if you have a preference, but don't be upset if you are served whatever the guy with the knife decides you should have. If you're on a sandwich-only diet (or what we like to call, "a sandwich cleanse") and you stumble across this place, go for the steak variety. It's an example of simplicity across the board - plain white roll, lettuce, tomato, steak, dressing - but it does the trick. Sweet sassy molassy, this thing is...sweet. This is the type of drink you would have killed for at age 8, when all you cared about was sugar and you also had another round of teeth on the way. That ain't the case anymore, so if you are inclined to get one of these, do you and your teeth a favor and get one to share...as a dessert.